First I pitted them and chopped them up. My big mistake was to not measure the fruit. I am pretty good at measuring by site and kept thinking that this looked like more than 4 cups, but I marched on not listening to my instincts. You add the pectin at this point, before the sugar, I could have added another half package of pectin here. I didn't add any water because my plums were very juicy. Bring this to a boil that can't be stirred down. This will take quite a while. 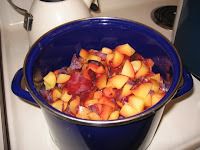 After I had it cooking for a while and the plums were getting soft I pulled out my hand mixer and used it to chop things up a little finer because I didn't want chunks in this jam. 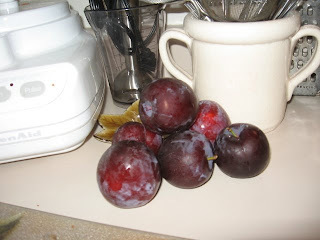 I have made plum jam before where I added some ginger for a little extra zing, but I didn't want to do anything to take away from the flavor of these plums and I knew the sugar would do enough of that. Once you have that rolling boil that can't be stirred down you will proceed to add the sugar. This batch called for a whopping 10 cups of sugar. 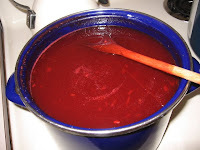 Normally I would cut back but, in jam it is important to use the measurement called for and since you only use a teaspoon or two at a time I figure it can't be that bad for you. After all the sugar is in and dissolved you have to bring it back to a rolling boil and let it boil for 4 minutes. 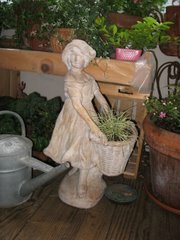 As you can see in the pictures I have pot quite full so I had to keep stirring it so that it wouldn't boil over. 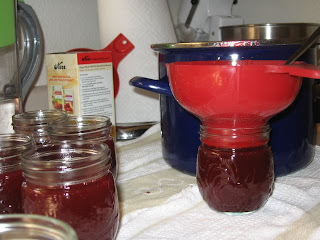 Well, my jam looked beautiful but it wouldn't set so the next day I dumped it all back in the pot and added a half pack of pectin to 1/2 cup of water and brought it back to a boil again. It was a pain, but in the end worth it. I now have perfect jam. I like to do the hot water bath method of sealing my jars so out comes the canning pot and fill it up with water. After this boils I sterilize my lids and rings. I like to use the dishwasher for my jars and time it so that they are just coming out and hot as I am ready to spoon my jam into them. Then the filled jars go into the bath for 10 minutes. I am happy to report that every jar gave me the little ping that is music to my ears and tells me that they have sealed. So when life gives you carrots make carrot salad and carrot cake...zucchini, make zucchini pie...and if it is strawberries or plums...well, just make jam! Whatever life gives you find a way to make it delicious! Yummy!!!! I wish I could have some... ;) Love your last line "whatever life gives you, find a way to make it delicious!"